Andhra Pradesh Chief Minister and Telugu Desam Party president N Chandrababu Naidu will campaign for JD(S) Party today. 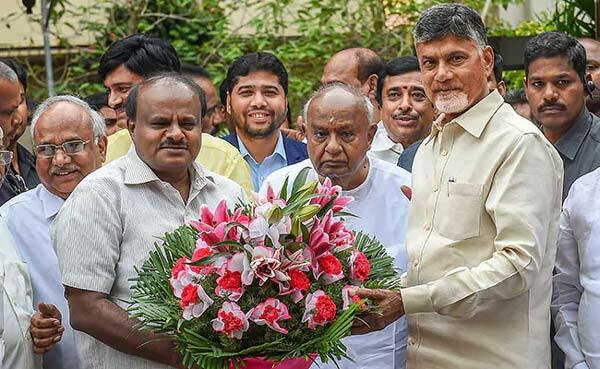 CBN will canvass for former Prime Minister HD Deve Gowda’s grandson and Chief Minister HD Kumaraswamy's son Nikhil Kumar in Mandya constituency. It seems the JD(S) was worried about Nikhil’s prospects because of which Deve Gowda and Kumaraswamy had been campaigning extensively for him in the past three days. They had requested Naidu to campaign for Nikhil following tough fight from Sumalatha Ambareesh, a widow of ex-minister late MH Ambareesh and an Independent candidate in Mandya LS seat. Naidu will hold road shows in Melukote and Pandavapura along with Gowda. Later, he would take part in a public meeting to be held in Pandavapura town at 5 pm. While many star actors in Kannada industry are lending their support to Sumalatha and BJP too is backing her, CBN took a brave decision by accepting to campaign for Nikhil owing to his close association with Deve Gowda who campaigned for TDP during AP elections. Sumalatha, born in Guntur, needs no introduction for Telugus. She acted in numerous Telugu films opposite star heroes. Her husband, former MP from Mandya, passed away on Nov 24th, last year. Congress refused to give ticket to Sumalatha as the segment was allotted to JD (S) as part of their alliance. Political analysts opine that, Babu should have accepted to campaign against Sumalatha who has Telugu roots.